Do your bra straps keep falling off or digging to shoulders? The most common reason for straps falling off or digging in is a too large bra band. Your body isn´t symmetric, so it´s natural that most women have asymmetrical breasts. Is it time for a new sports bra? Your sports bra is the garment that endures the most stress when you exercise. The constant stretch of fabrics, body heat and sweat will take it´s toll on your bra. How to choose a sports bra for large breasts? We have chosen these bras into our store's offering, because they are especially designed for larger busts and give the best possible support. 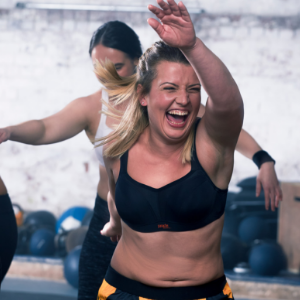 The size range is so comprehensive that almost all curvy women will find a sports bra that is suited to her and the chosen sporting activity. Follow our releases where we tell about different bra styles. In this feature you can learn about plunge bra. Follow our releases where we tell about different bra styles. In this feature you can learn about full-cup bra. Follow our releases where we tell about different bra styles. In this feature you can learn about half-cup bra. Follow our releases where we tell about different bra styles. In this feature you can learn about t-shirt bra. Follow our releases where we tell about different bra styles. In this feature you can learn about bralette bra. Follow our releases where we tell about different bra styles. In this feature you can learn about push-up bra. Follow our releases where we tell about different bra styles. In this feature you can learn about minimizer bra.